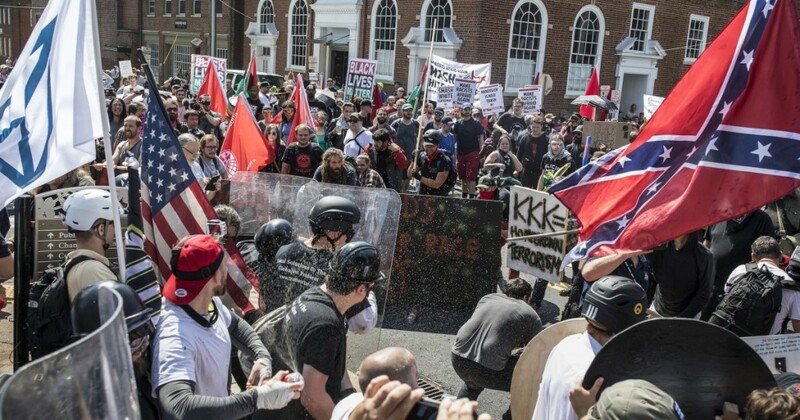 As the one year anniversary approaches for the Charlottesville rally that killed one and injured 20, A.C. Thompson, a reporter on “Frontline” (PBS, 10 p.m., check local listings) and ProPublica takes a deeper look at what happened and what it meant. “Documenting Hate: Charlottesville” shows how police laid off as white nationalists attacked those protesting their hate, and identifies some of the white nationalists from their tiki parades in a manner that law enforcement doesn’t seem to be. After three hours of the “Bachelorette” finale Monday, it may be hard to tune in for another two hours of the franchise. But “Bachelor in Paradise” (ABC, 8 p.m.) is the best way to take in the series — goofy and faster moving, with less fixed dialogue about journeys and such and a better chance for coupling than you’d expect. Plus there are goofballs like male model Jordan Kimball. It’s on twice a week beginning next week. The solo reality survival show makes its way to broadcast TV with the debut of the new “Castaways” (ABC, 10 p.m.) in which 12 people are abandoned deep in Indonesia, unaware there are competitors nearby. In the new comedy “Carter” (WGN America, 10 p.m.), Jerry O’Connell plays a failed Hollywood actor in a TV procedural who tries to ply his detective skills on real cases back home in Ontario. You know preseason football week has begun with the return of “Hard Knocks: Training Camp” (HBO, 10 p.m.), this time with the Cleveland Browns. “The Bold Type” (Freeform, 8 p.m.) ends its second season with Sutton covering Fashion Week in Paris. “Face Off” (Syfy, 9 p.m.) has its last episode ever, with contestants shooting short films based on Lewis Carroll and vying for a $100,000 prize. The spoofy “Wrecked” (TBS, 10 p.m.) returns for a third season on a new island, where a malevolent billionaire makes everyone hunt each other. The task on the second “Making It” (NBC, 10 p.m.) is constructing a terrarium. Marcus Samuelson visits Miami’s Haitian community on “No Passport Required” (PBS, 9 p.m., check local listings). There’s another battle to fight before tonight’s season five finale of “The 100” (CW, 8 p.m.) is over. More cuts come on “America’s Got Talent” (NBC, 8 p.m.). Surf enlists the boys in a surprise job with devastating consequences on “Animal Kingdom” (TNT, 9 p.m.). A billionaire pitches a book on “Younger” (TV Land, 10 p.m.). On “The Outpost” (CW, 9 p.m.), five killers from Talon’s past ride into town. It’s Christmas on “Outdaughtered” (TLC, 9 p.m.). Jude fights for what he believes in on “Hit the Floor” (BET, 10 p.m.). North Carolina barbecuers compete on “Chopped” (Food, 9 p.m.). Mariah’s labor intensifies on “Rattled” (TLC, 10 p.m.). Early film comedy star Harold Lloyd is featured all day on Turner Classic Movies in mostly silent films, with “Ask Father” (6 a.m.), “Never Weaken” (6:15 a.m.), “High and Dizzy” (7 a.m.), “An Eastern Westerner” (7:30 a.m.), “Among Those Present” (8 a.m.), “Now or Never” (8:45 a.m.), “Why Worry?” (9:30 a.m.), “Hot Water” (10:45 a.m.), “For Heaven’s Sake” (11:45 a.m.), “The Kid Brother” (1 p.m.), “Welcome Danger” (2:30 p.m.), “Feet First” (4:30 p.m.), “The Milky Way” (6:15 p.m.), “Safety Last!” (8 p.m.), “Girl Sky” (9:30 p.m.), “The Freshman” (11 p.m.), “Speedy” (12:30 a.m.), “Movie Crazy” (2:15 a.m.) and “The Cat’s Paw” (4 a.m.). Baseball includes Houston at San Francisco (MLB, 3:30 p.m.) and Minnesota at Cleveland (MLB, 7 p.m.). There are Southeast region semifinals in Little League (ESPN2, 6 and 8 p.m.). The WNBA has Vegas at Atlanta (NBA, 7 p.m.) and Washington at Phoenix (NBA, 10 p.m.). Stage 1 begins in cycling’s Tour of Utah (Fox Sports 2, 3:30 p.m.). Kelly Ripa and Ryan Seacrest: Dana Delany, Becca Kuprin and Garrett Yrigoyen, Sophia Bush. The View: Kevin Costner, Jaron Lanier (rerun). The Talk: David Duchovny, Rozzi (rerun). Harry Connick: Thandie Newton, Gladys Knight, Lior Suchard (rerun). Steve Harvey: Faith Jenkins (rerun). Ellen DeGeneres: Woody Harrelson, Gayle King, Panic at the Disco (rerun). Wendy Williams: Thalia (rerun). Stephen Colbert: Joe Manganiello, Sen. Cory Booker. Jimmy Kimmel: Megan Mullally, John Cho, Juice WRLD. Jimmy Fallon: Seth Rogen, Spike Lee, Big Boi. Seth Meyers: Taylor Schilling, Brendan Gleeson, Jason Kander, Joey Castillo. James Corden: Kris Jenner, Ben Schwartz. Carson Daly: Anna Paquin, Absofacto, Ryan Hansen (rerun). Trevor Noah: Rob Cordrry. Conan O’Brien: Kevin Nealon, Yvonne Strahovski, Allen Strickland Williams (rerun).